10 most beautiful & exotic honeymoon hotels around the world to book in 2018! The expectation of what a honeymoon suite has changed for the millenials. It’s no longer about just finding a beautiful location, it’s now also a lot about where you are exactly staying and what are the fancies associated with the place! As a newly wed now, you want honeymoon suites, which offer amenities such as private pools, sunken Jacuzzis, outdoor showers, and big terraces. 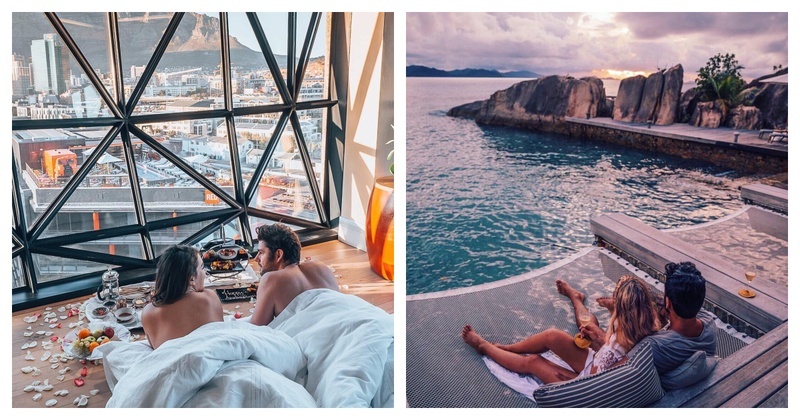 Given the fact that this trip could be the most expensive and memorable of a couple’s life together, the list of expectations for modern honeymooners is totes understandable. Hotel - Tye River Cabin Co. Always wanted to soak in a hot tub outside a cabin in the woods? Well you’ll find this one right outside of Skykomish, Washington. There is a private cabin community of Timber Lane Village where you’ll find the spectacular Tye River Cabin Co., named after the neighboring Tye River. You can have all those long snowy walks with your spouse followed by a warm soak in the cabins outdoor hot tub. Sounds like a perfect winter dream right? This architectural marvel was transformed from a former grain silo into a magnificent luxurious hotel by world renowned designer, Thomas Heatherwick. The Silo Hotel is the ultimate spot to take your other half while exploring the exquisite natural beauty of South Africa's Mother City. And provides for the best view of Cape Town along with the unforgettable sunsets like this one right there. We have all slept under the stars, but how about sleeping under a real-life snow globe? Levin Iglut in Lapland, Finland will literally have you pinch yourself with disbelief when you do so. You can watch the lights of the aurora borealis dance on crystal clear nights, or bask in the soft snow flurries as you cozy up beneath the sheets all while you experience the unique blend of this rugged luxury there. It may all feel like you are in a dream, but rest assured, this place is very real. How about dipping into this lagoon pool in the French Rivera and working on your tan with your beloved? This sandy-bottomed lagoon pool provides for one of the most beautiful views of Monaco. You can start your day exploring the luxury casinos and chic boutiques of the region, and then head back for food, drinks, and hookah at The Blue Gin, the hotel’s heated outdoor terrace and then end your day dipping in this pool again. How about taking long swimming sessions with your beloved here? No this is not a bed of roses, this is pure architectural magic. Resting on the shores of Koh Samui’s Chaweng Beach, The Library hotel is a delight to take your other-half on your honeymoon. This Instagram-worthy red pool, which gains its eye-popping aesthetic from the sun's reflection of thousands of tiny red mosaic tiles, is solid evidence of unique design tastefully merging with the timeless appeal of mother nature. Félicité Island in Seychelles is home to some of the island’s richest flora and fauna. Although, what’s commendable about Six Senses Zil Pasyon’ hotel is their sustainable approach. The resort houses its own osmosis plant and water refinery and has used only the island’s endemic plant life instead of importing flora, and prioritizes the use of solar energy. It also provides for sunset views like these. How about a surreal romantic night in a private villa at Alaya Dedaun Kuta in Bali's favorite beach town? Other than the petals, the ambiance, and the "Thousand Flowers" package this villa comes with a four-course meal, a glass of red wine, and a guarantee that you'll never do date night better than this. This is as romantic as romance in the desert gets! An oasis in the heart of the Empty Quarter where you can gaze out over the neverending dunes of the legendary Rub’Al Khali, the largest uninterrupted desert in the world is the place to be with your spouse. Slip into the free-form pool at sunset to watch as stars appear, shrouding the beautiful landscape with Arabian night. A honeymoon dessert dream doesn't get better than this! Four Seasons at Kuda Huraa marries is a luxury honeymoon destination that gives best romantic experience for the newly wed couples. The resort’s spa promises an essential oils massage of your dreams from the minute you step off the traditional dhoni boat that takes guests to the "spa island." You can chase your spa day by spending some time poolside or with a two-hour fishing excursion or spend the days watching sunsets and sunrises from your own private infinity pool - your choice. This hotel in Lamu, Kenya is the ultimate African paradise - it’s an expansive guest home with an overflowing personality. The property was initially the second home of an Italian family but was later turned into a castaway resort by a prestigious group of architects and artists. Now, the luxury hotel, is equipped not only with three villas and twenty-five rooms, but with a relaxing pool, long white beaches, a terrace cocktail bar, and a restaurant specializing in local seafood. The resort also offers specialty recreation with a focus on wellness, water sports, and Swahili culture. Honeymoon perfect right?